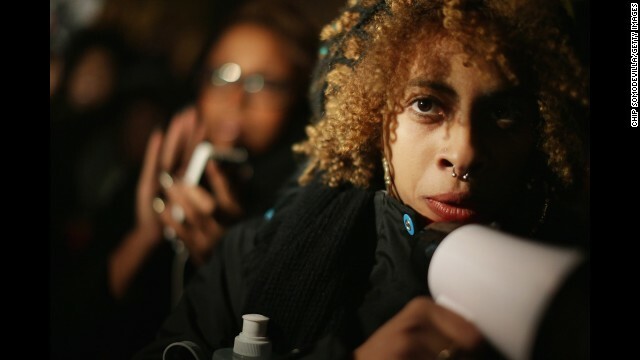 New York protester: "Now we're going to make sure things are going to change"
From New York to Los Angeles and dozens and dozens of cities in between, protesters flooded the streets to denounce a Missouri grand jury's decision not to indict Ferguson police Officer Darren Wilson. 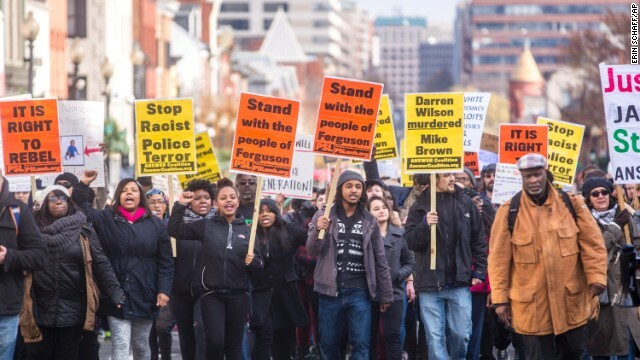 A day after the country learned Wilson won't face criminal charges for killing unarmed teenager Michael Brown, protests sprouted up in more than 170 U.S. cities. 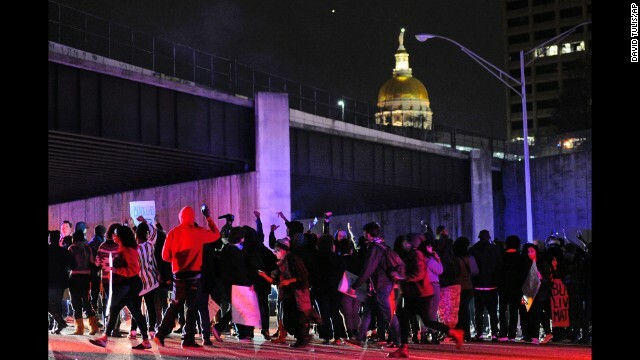 Some demonstrations blocked bridges, tunnels and major highways. 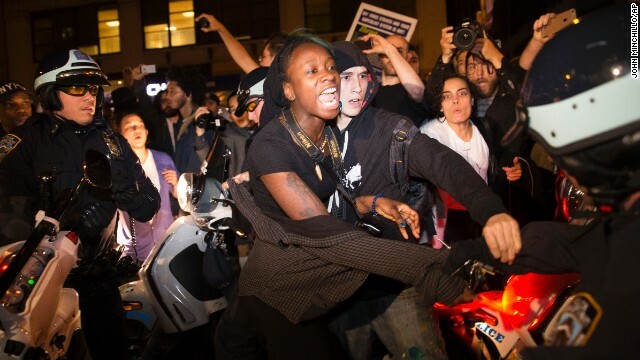 But unlike the violence that erupted in Ferguson on Monday night, the protests across the country Tuesday night were largely peaceful. 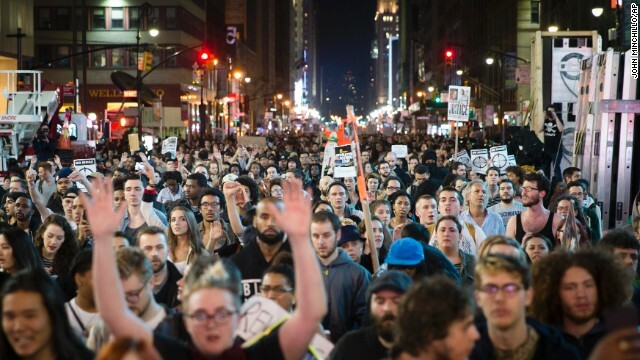 A massive protest wound its way from Union Square to FDR Drive and to the United Nations, Times Square and Harlem. "Now it's not clear where we're going," said CNN's Miguel Marquez, who was interviewing protesters as they continued marching after midnight. 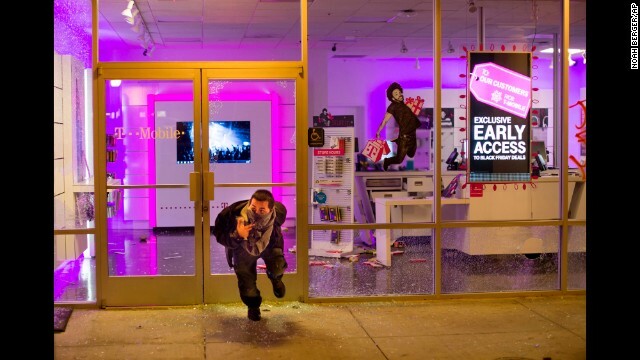 Perhaps the greatest concentration of turmoil Tuesday night was in Oakland, where vandals smashed the windows of a car dealership and looted several businesses, including a T-Mobile cell phone store. 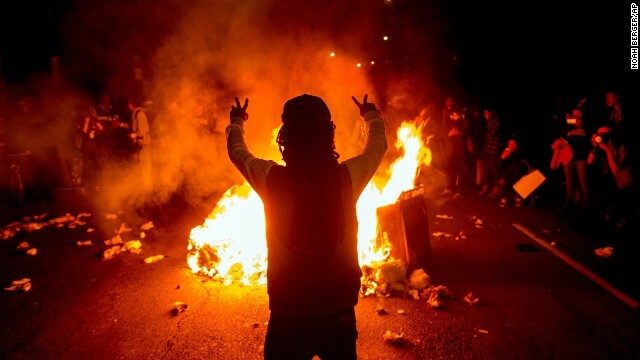 Some also set several bonfires in the city. 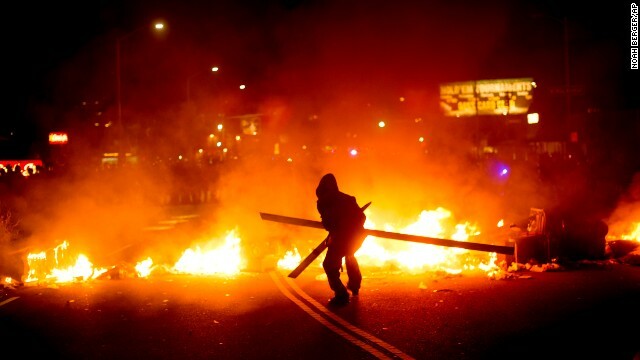 One row of bonfires stretched across a road, blocking off access, footage from CNN affiliate KPIX showed. 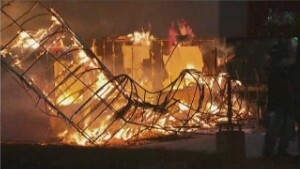 Some people were seen adding more items to the fires. 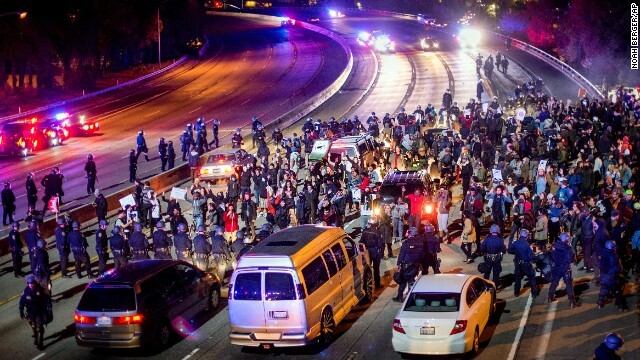 A stretch of the 101 Freeway in Los Angeles was shut down in both directions after protesters took road blocks from the streets, along with debris, and placed them on the freeway, police said. 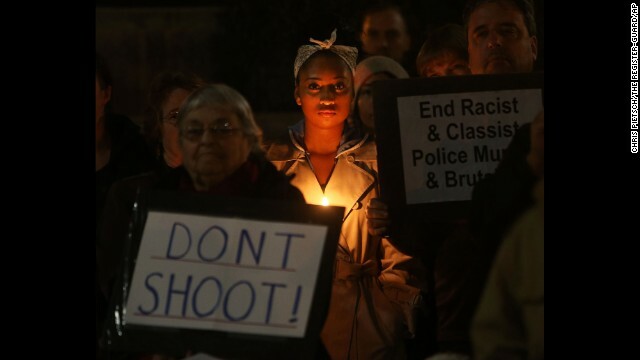 And demonstrators gathered outside of the Los Angeles Police Department headquarters, Officer Sara Faden said. Faden said protesters are demonstrating peacefully. 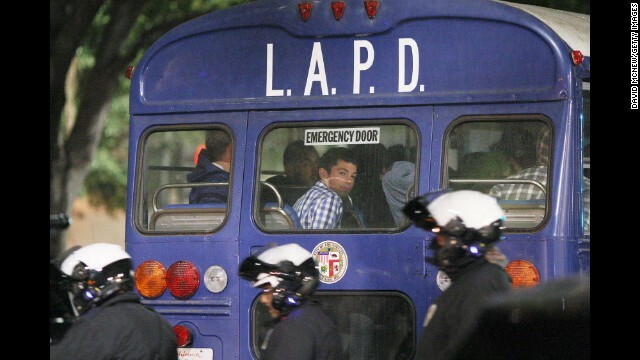 An LAPD spokesman said officers are allowing people to vent. "We have detained people. 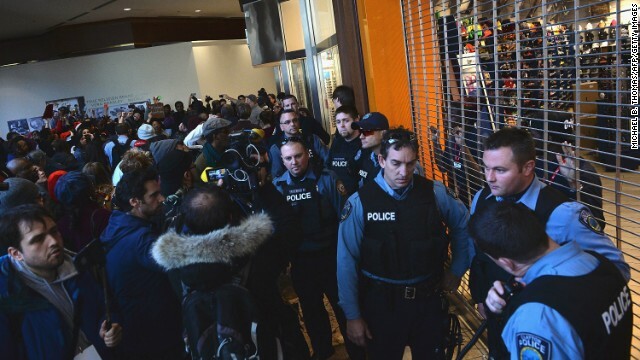 We don't have any property damage to speak of," Officer Jack Richter said. 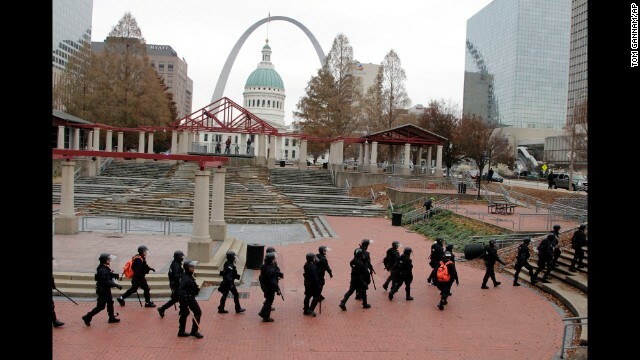 "We are letting (the people) exercise their constitutional rights." 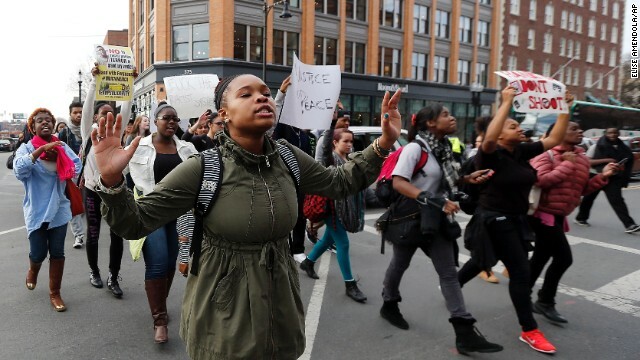 Mayor Marty Walsh estimated about 1,000 protesters took to the streets Tuesday night. The gathering has been largely peaceful. 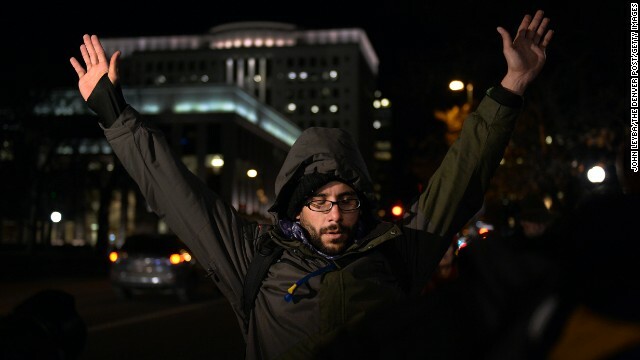 "It's a beautiful thing to see," demonstrator Daniel Jose Older said. 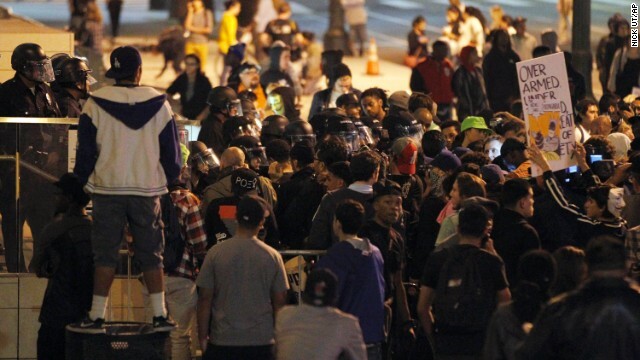 Several hundred people took to the streets of Denver on Tuesday night, police said. 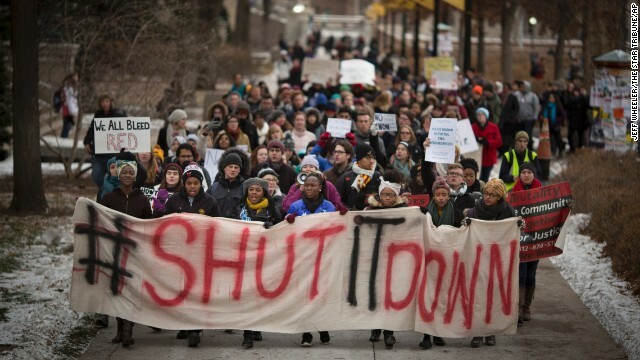 Officers tried to prevent demonstrators from marching onto Interstate 25. 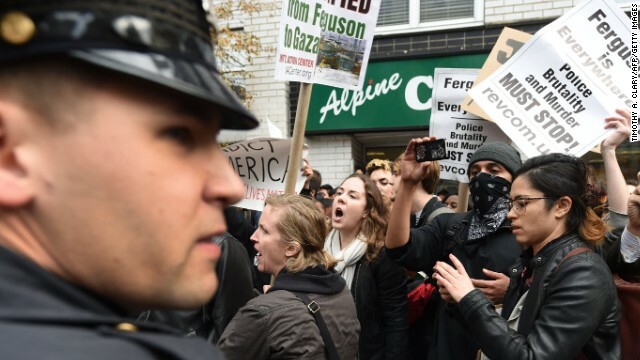 Most protesters dispersed peacefully, but a "small group" refused and grabbed officers. 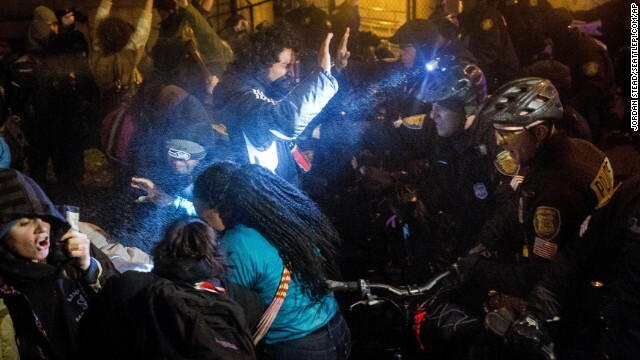 Officers used pepper spray, and three people were arrested, police said. 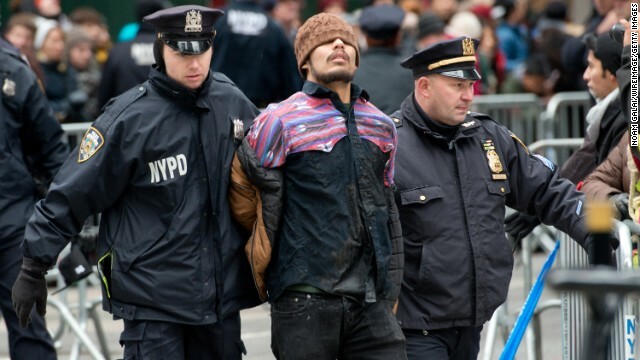 About five protesters were arrested after marching on Interstate 35, CNN affiliate WFAA said. 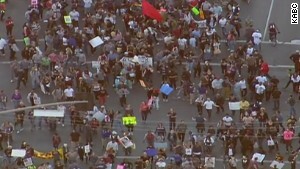 Some 200 demonstrators gathered at Dallas police headquarters before marching onto the interstate, the affiliate said. 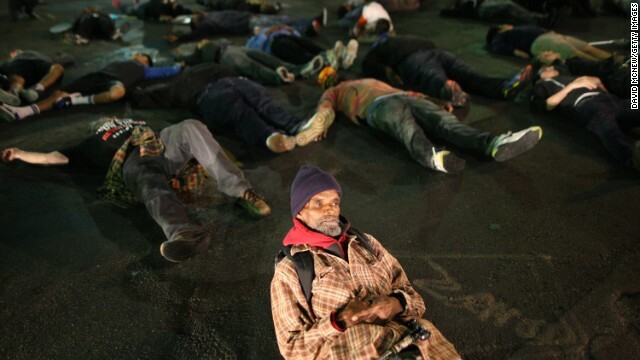 In Washington, protesters lay down on a sidewalk outside police headquarters as if dead, according to a tweet by Nikki Burdine of CNN affiliate WUSA. A woman in a group blocking an intersection was run over by a car. 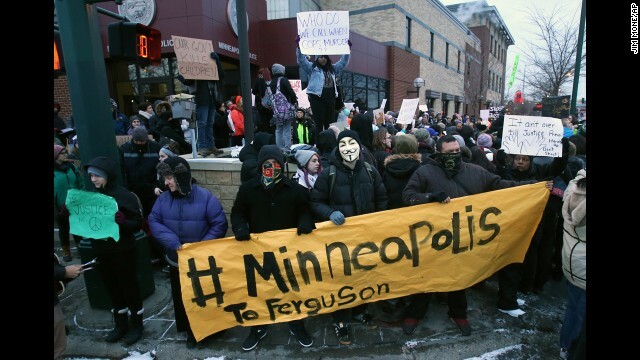 The Star Tribune newspaper reported that the driver of the car honked at the protesters before knocking a few people onto the hood of the vehicle and apparently running over the woman's legs. She was hospitalized with "very minor injuries." 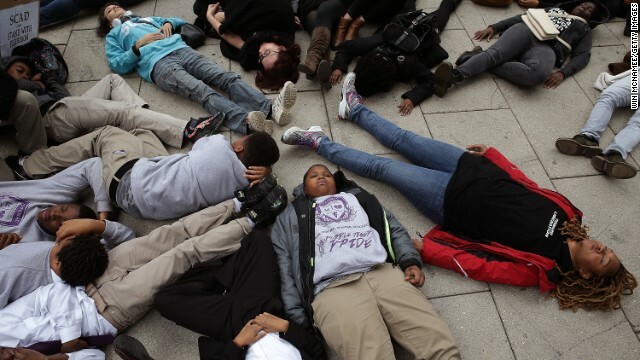 About 200 members of the Black Youth Project staged a sit-in outside Mayor Rahm Emanuel's office Tuesday afternoon. They planned to be there for 28 hours. 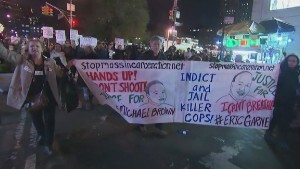 Protesters in the New York area briefly blocked one of the entrances to the Lincoln Tunnel Tuesday evening, but then headed off to the city's West Side. The Public Enemy anthem pumping from mounted speakers at a protest in downtown Atlanta captured the mood of the crowd Tuesday night. 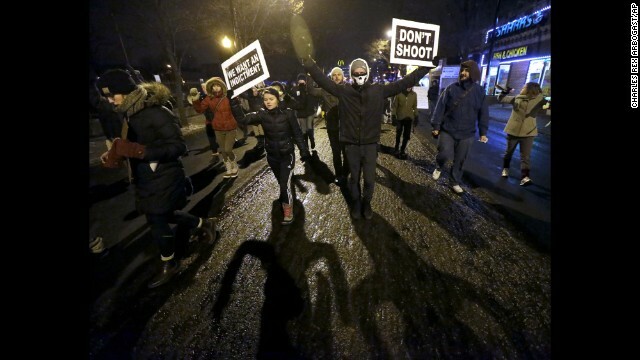 About 300 people tried to follow Public Enemy's advice when they gathered to protest the grand jury's decision. 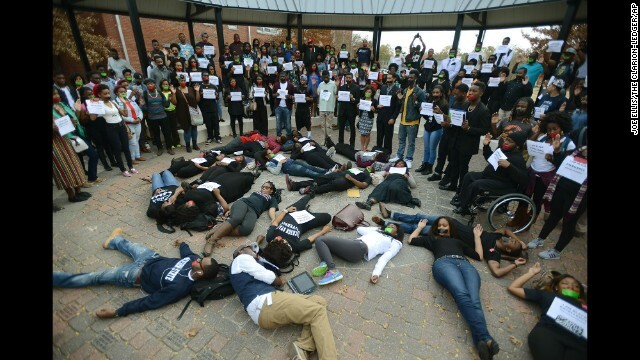 As helicopters circled above, black college students, white urban hipsters in skinny jeans, middle-aged socialists and black militants in berets gathered for a raucous rally to vent their anger at the events in Ferguson. 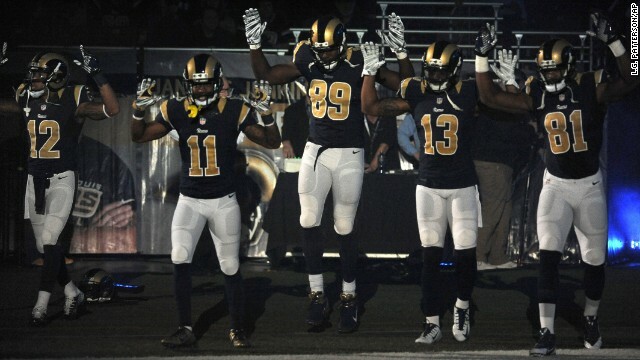 "They have given us no justice! 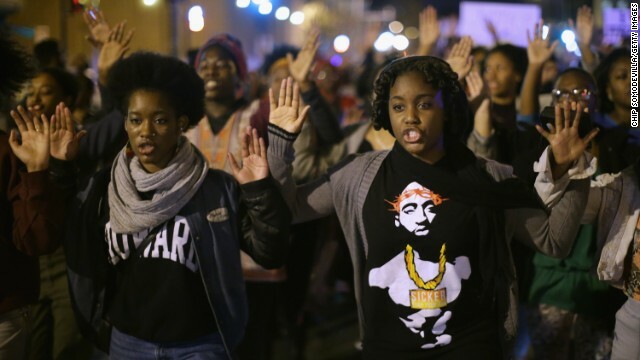 We will give them no peace," the demonstrators chanted at they massed in front of the Underground Atlanta shopping district. Some protesters had also gathered outside CNN Center. 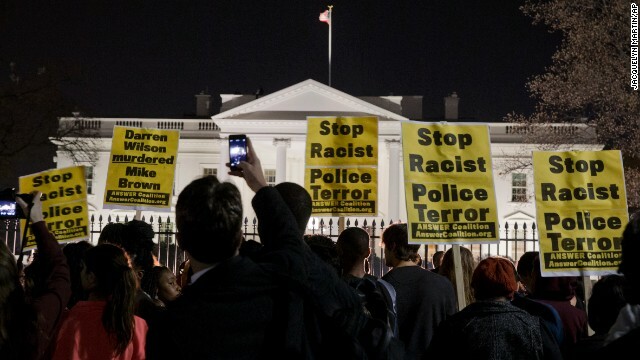 One demonstrator wore a T-shirt that read, "Racism isn't over but I'm over racism." 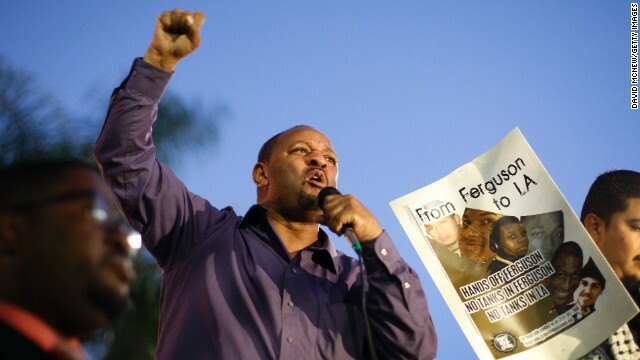 "It's a travesty; it's just not right," ShaCzar Brown said as held up a sign that said, "Stop killer cops." 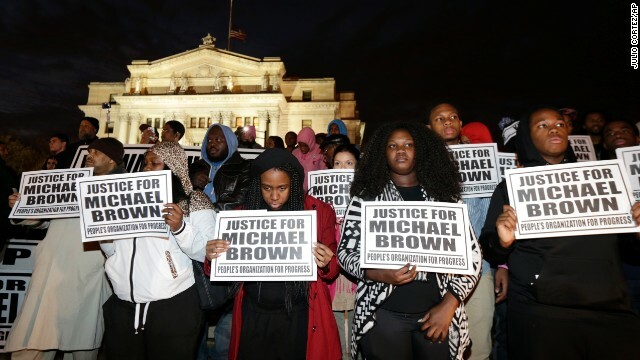 "Seventy years ago, it was legal to kill black people," Brown says, referring to the spate of lynchings that spread through the U.S. in the late 19th and early 20th centuries. "It's essentially still legal." Atlanta, birthplace of the Rev. 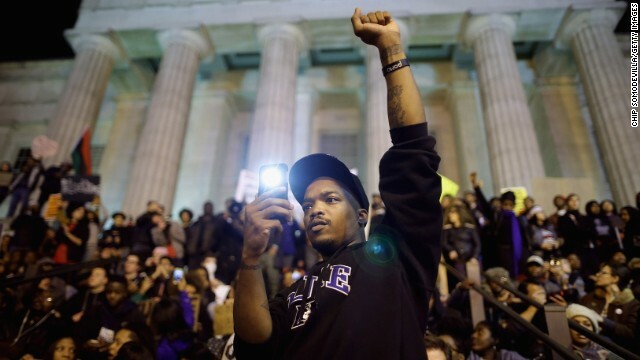 Martin Luther King Jr., also saw emotional reaction Monday night when about 200 students gathered at Morehouse College to hear the grand jury's decision. A collective gasp rippled through the crowd when it came. 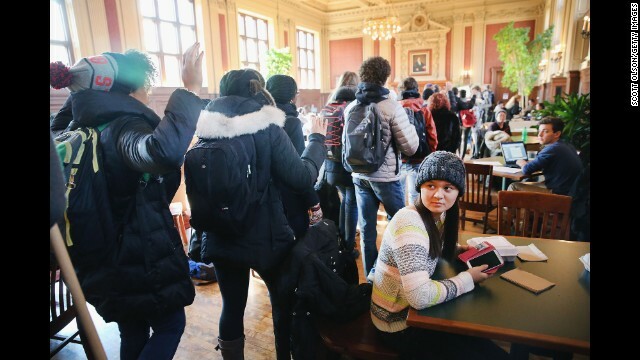 Some of the students at the historically black men's school looked at one another in disbelief, others started to tear up, and a few stared ahead as their jaws dropped. 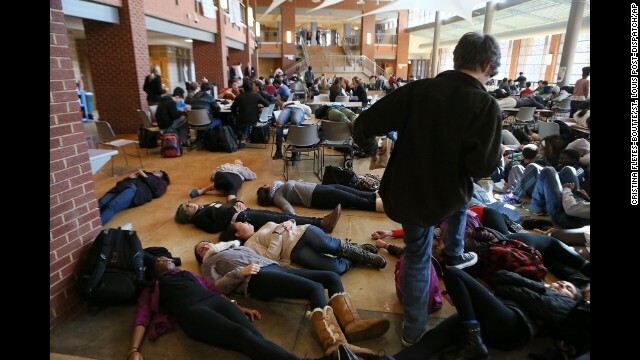 Police sirens wailed in the distance as the students chanted: "Ferguson's hell is America's hell." 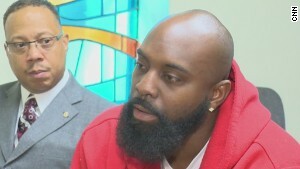 "I think what happened yesterday is a great injustice to everyone that's been fighting for equality in this country," one Chicago protester told WGN on Tuesday. "And I think that just because a bad decision was made doesn't mean people who believe in equality are going to fall silent." 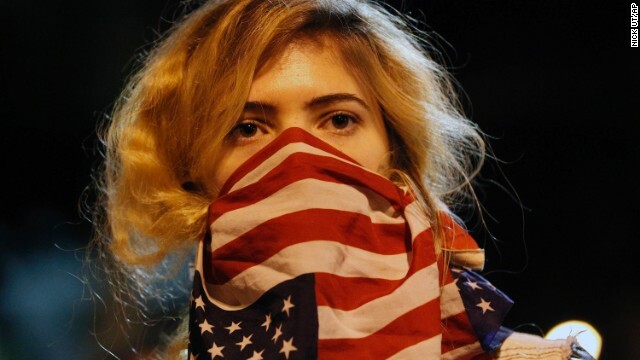 Protests have been organized in more than 30 states, the District of Columbia and at least three other countries, according to information compiled by CNN and a site set up to help organize protest efforts. CNN's Jessica Ravitz, John Blake, Lorenza Brascia, Greg Morrison, Rob Frehse, Tina Burnside and Bill Kirkos contributed to this report.